Jo's Blue AGA: Hazelnut and Peach Frangipane. 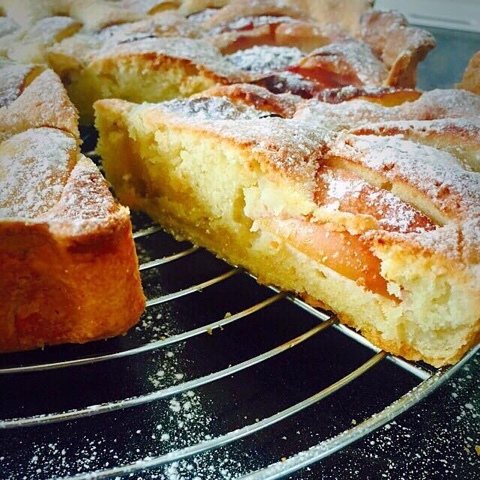 Frangipane is one of my all time favourite bakes, served warm with custard or at room temp with a huge dollop of extra thick double cream. Make sure your oven is properly preheated to ensure you don’t get a soggy bottom! Start by pulsing 50g hazelnuts until roughly chopped in a food processor, put to one side,now in the same food processor place the flour, butter, sugar and salt, pulse with same metal blade until you have a breadcrumb consistency, add the chopped hazelnuts. Add the egg yolks, whizz briefly, then add a little chilled water tbsp at a time until the dough comes together. Wrap with clingfilm and chill for at least 30 minutes. Roll out the pastry and line the tart tin, spread with Nutella and chill for at least 15 minutes in the fridge. To make the filling, blitz the hazelnuts to a sandy consistency in a food processor. Add the butter, sugar, eggs, flour and ground almonds blend until light and fluffy. Spoon the frangipane into the pastry case and spread level. Slice the nectarines into eighths and arrange evenly spaced, bottoms up, around the tart. Bake for 35-40 minutes or until golden. If the tart starts to colour too quickly, cover loosely with foil.